‘Fruit very large, somewhat cordate, smallest at the crown; of a greenish yellow colour, striped or marbled with red; pulp tender, sweet, rich, and aromatic: ripens in October and lasts till Christmas.’ [FCM p.40/1845]. ‘A beautiful and valuable apple, both as regards its size and quality. It is more adapted for culinary than dessert use, but is also desirable for the latter were it only on account of its noble appearance at the table. It is in use from September to December. The tree is a strong and vigorous grower, producing long stout shoots, is perfectly hardy and a good bearer. 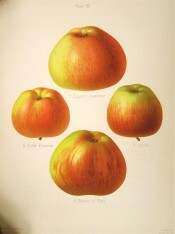 This apple was introduced to this country by Mr. Lee, nurseryman of Hammersmith, in 1817, and was exhibited by him at the London Horticultural Society; the specimen produced being five inches and a half in diameter, four inches deep, sixteen inches in circumference, and weighed nineteen ounces. It is generally supposed that this was its first appearance in England; but there can be little doubt that it is the Phoenix Apple figured by Brookshaw, whose account of it in 1808, is as follows: — " It was much grown fifty years back in the neighbourhood of Twickenham, but was rather lost. The late Mr. Ash, nurseryman at Strawberry Hill, near Twickenham, preserved it from his father, who had an old tree of it. This specimen came from that tree. This apple was seen in Russia by an English nobleman, who thought it so excellent an apple, that he was induced to send some trees of it to England, and what will appear extraordinary to English gardeners, they were taken up in the summer with their leaves on, when they could not be less than twelve years old by their appearance, and when they arrived, after being six months before they came to hand, they were planted and produced fruit, and are now fine trees. The apple has a bloom on it like a red plum when on the tree, and is a very excellent beautiful apple, ripens in October, and will keep through December. It is to be had at the late Mr. Ash's nursery, at Strawberry Hill, near Twickenham, under the name of Phoenix Apple, from its being lost and revived." [Hogg p.78/1851 ]. ‘A very large variety, streaked with red and yellow, a kitchen apple.’ [David Crichton. NHM vol.1 p60/1864]. PB pl.LXXXVIX/1812. HP pl.XII/1878. Listed as ‘Mobb’s large early’ in all published catalogues [Apple no.20/1843]. Listed as ‘Alexander, apple no.78’ in a hand written list of apples in an 1850 catalogue held at Camden Park [CPA]. Most of the plants hand-written in this catalogue subsequently appeared in the 1857 catalogue. That the apples did not is probably an oversight. ‘Mobb’s Large Early’ and ‘Alexander’ are referred to several times in William Macarthur’s records. ‘Mobb’s Large Early. March-April. Moderate. Kitchen only, a very large apple.’ [Notebook no.9, MP A2948]. ‘Mobb’s Large Early. Alexander ? [Macarthur’s query. He seems to be in doubt about its identity. In correspondence with customers he often put ‘Alexander’ in brackets after ‘Mobb’s’.] Very large. Kitchen fruit.’ [Diary B, 1862, MP A2951]. ‘Alexander’ is also listed in this gardening diary as apple no.53 with no description. [Diary B, 1862, MP A2951]. It is unclear if ‘Mobb’s Large Early’ is a synonym of ‘Alexander’ of if the tree introduced as the former was incorrectly named. I have found no reference to ‘Mobb’s Large Early’ in the contemporary literature.